Like any word or thing, when someone says they are a Christian, you are bound to have a certain perception of who they are or what they believe. Living in the middle of America, a voice like Anne Lamott, the famous author is a very different voice. Traveling late at night to my home and my sister's wedding I listened to an audio book of Plan B: Further Thoughts on Faith read by the author Anne Lamott. Famous by now, Lamott, at the time she writes this has recently turned 50, raising a 15 year old son alone, struggling with forgiveness after the death of her mother, and is deeply distressed over the actions of President George W. Bush. Lamott writes in this book many of her current thoughts on faith and life as a Liberal Presbyterian growing up in the bay area of California. Lamott is different from an evangelical Christian because she believes that a loving God surely would want everyone to go to heaven, but is very critical of those who do not give to the poor, help the needy, and reach out to these who are struggling in tough times. Her writing style is absolutely fantastic, and hearing her read her work is very fascinating because the things she talks about are so personal (like putting on wait in her menopausal years and the boredom which she often has experienced in raising her son Sam). 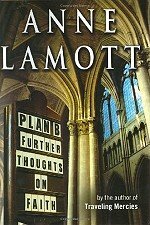 I certainly did not agree with everything Lamott had to say about God and Jesus, but I could still listen and pick out parts of wisdom and understanding she had picked up along her own travels. She reminds us that God loves all people, and that everyone is in need of forgiveness and what we have to offer them, she also reminds us that life is too short to wear uncomfortable pants and that parents get angry with their children because we are naturally angry people and children are some of the few people we can exercise control over and sometimes people do. There is a refreshingly honest quality that Lamott brings in her book as a democratic dreadlock-wearing, former drug using, sexually active, sing mother, cussing writer who occasionally preaches when her pastor Vernonica is not able to preach. Having watched a few interviews with her I can see she's a very interesting character. I am often wondering with a lot of people like her if they are getting the character first and paying much attention to the substance. I confess I have yet to read this book, and would highly recommend Traveling Mercies: Some Thoughts on Faith. Alison has also read Bird by Bird (and enjoyed it) and Anne's novel Blue Shoe (which she didn't care for quite so much). This is a great post. I'm definitely going to check her out. What's a girl gotta do to get a link up in this joint?! Good post- good referral. I will have to look her up. I'm am looking for a new read. Lamont was def. an interesting and entertaining 'listen' on our trip to CO. As I listened to her I wanted to shout, "RELAX, ENJOY LIFE!" I appreciate that she is able to appropriatly identify her emotions and thoughts and match those to words, but the woman seems to torture herself with trying to explain life away. For crying out loud, she names her cellulite "the aunties" and refers to that part of her body in 3rd person as a way of "dealing with her fat." i got to reading more of your posts:) I also really enjoyed this book. i actually liked it more than "traveling mercies". have you read that? You can see her growth from "mercies" to "plan b", but you're right about having to sift through some of the stuff to get to the nuggets. It was worth it though. I enjoyed the book, as I do much of her writing. I keep Bird by Bird on my shelf and flip through it probably weekly.